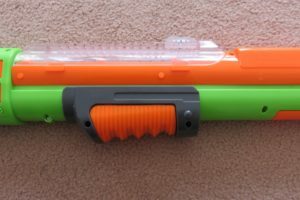 A jam-prone, mostly impractical blaster that is a lot of fun. 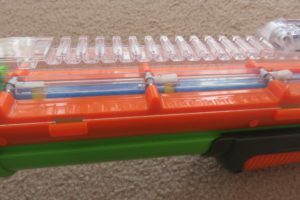 Unlike just about every other blaster currently on the market, the Monorail Blaster/Rail Raider is fed by an internal tube magazine. 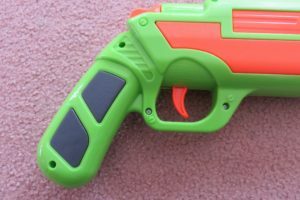 This is a feature that is incredibly rare among foam blasters, with the only other example that comes to mind being the disc-firing Fusefire. 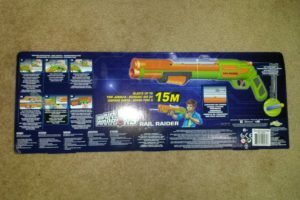 A blaster with such a unique and novel feature was naturally met with much hype and anticipation upon its reveal. Nothing different or special about the box. A look down the top. 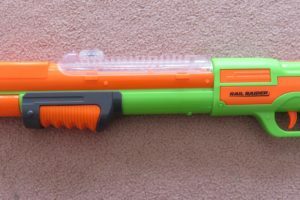 Close up of the tactical rail. 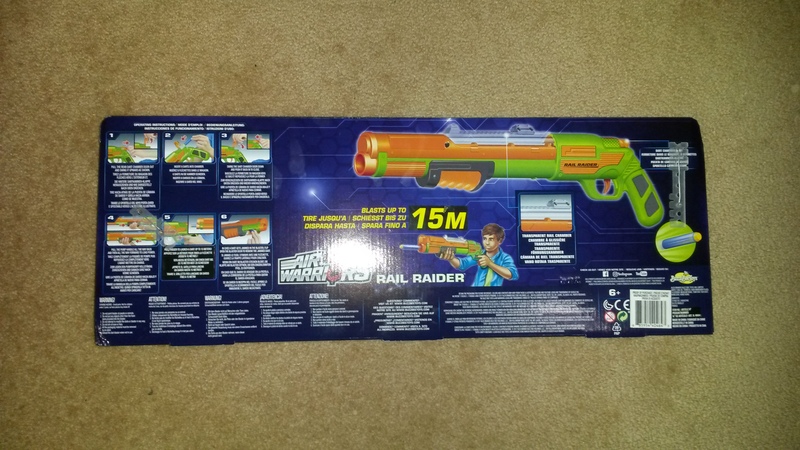 The Rail Raider is a fairly large, long pump action blaster. 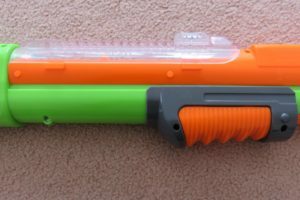 It is modelled after real-life shotguns, attempting to emulate to an extent both their look and function. 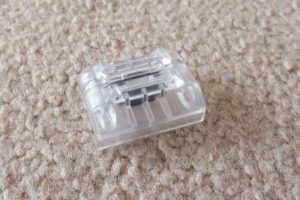 The Rail Raider is reasonably wide and chunky, and has a single tactical rail on top. While this rail is aesthetically quite different from most of Buzz Bee’s tactical rails, it is nonethless compatible with their attachments. Middle finger moved to a more comfortable position. I personally dislike the overall handle design. 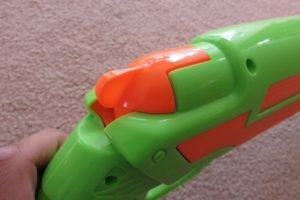 The handle itself is reasonably thick and of decent length, however there is a small gap between the trigger guard and the handle. This gap is large enough for a finger to fit inside, however I find it to be quite tight and extremely uncomfortable. This is exacerbated by how front-heavy the Rail Raider is, leading to a significant amount of force being exerted on the trapped finger. 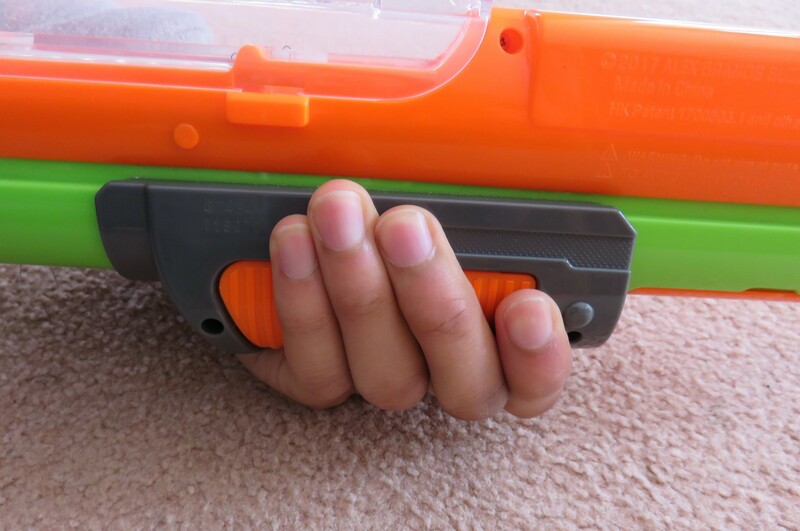 My personal grip position is to move the middle finger under the trigger guard. 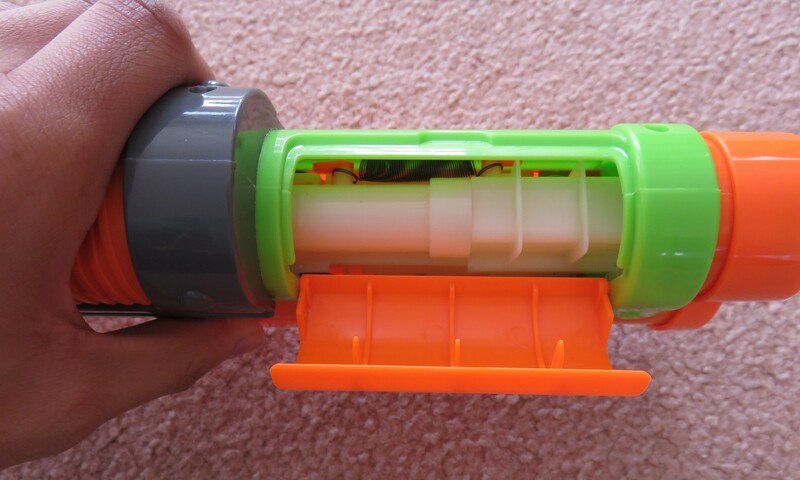 This is a much better position for supporting the blaster’s forward weight, and does not trap a finger in the gap. 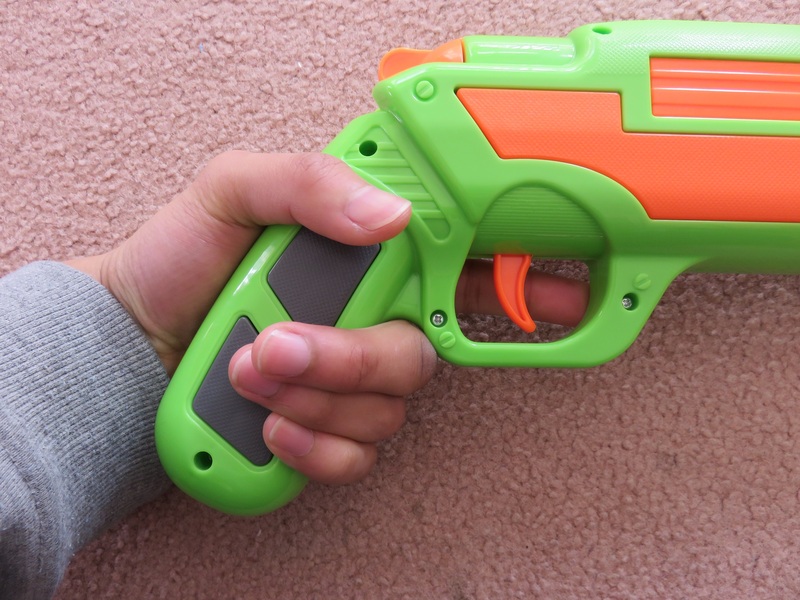 Also of note is the trigger position, which is much further forward from the handle than typical blasters. 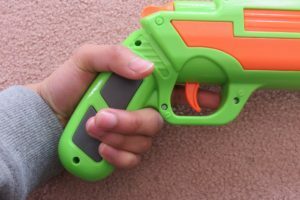 I personally find it to be a non-issue as I can reach the trigger easily, however may be an issue if you have small hands or short fingers. Underneath look at the pump grip. 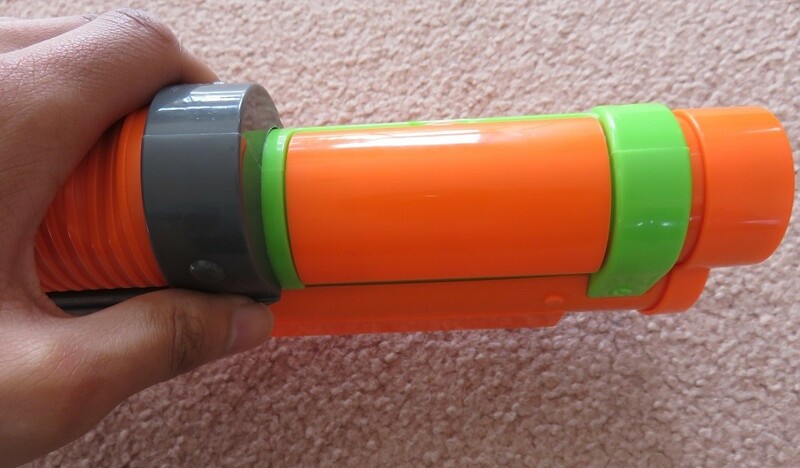 The pump grip is a different story. 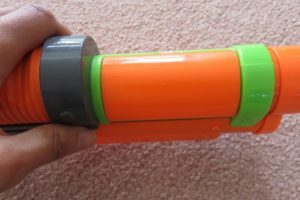 It is quite chunky and well sized, and feels quite nice to hold and pump. The pumping action of the Rail Raider feels quite solid. 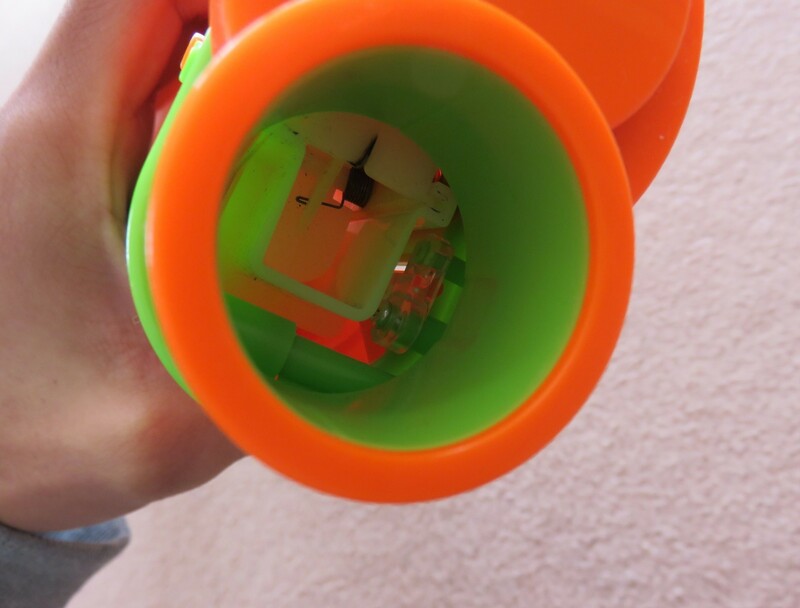 A look down the muzzle. 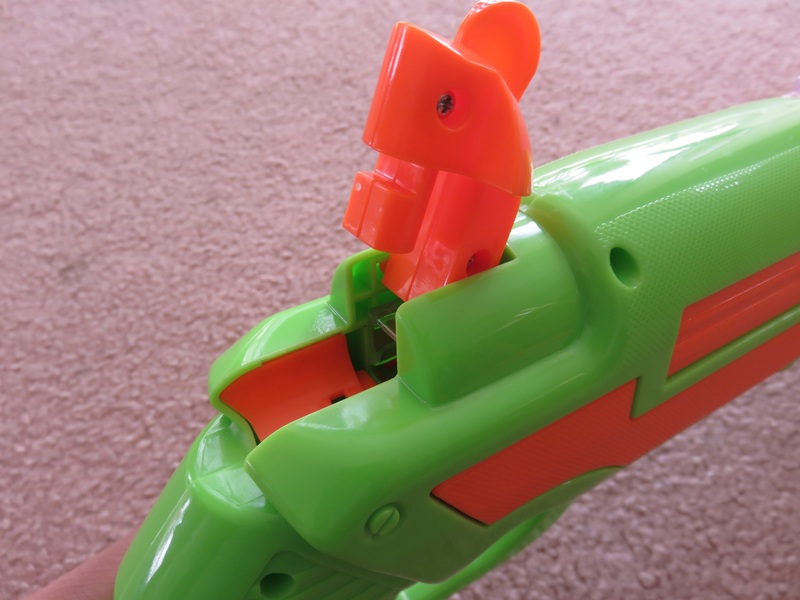 The Rail Raider has a jam door underneath the muzzle. It is hinged and swings open to the left. It can be opened at any time. 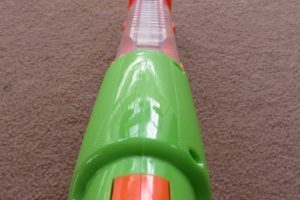 The jam door exposes the bolt and chamber area, allowing relatively easy clearing of any jams up front. Close up of the tube magazine. Close up of the dart chamber door. 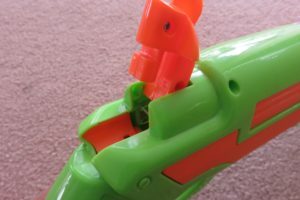 Close up of the magazine loaded. 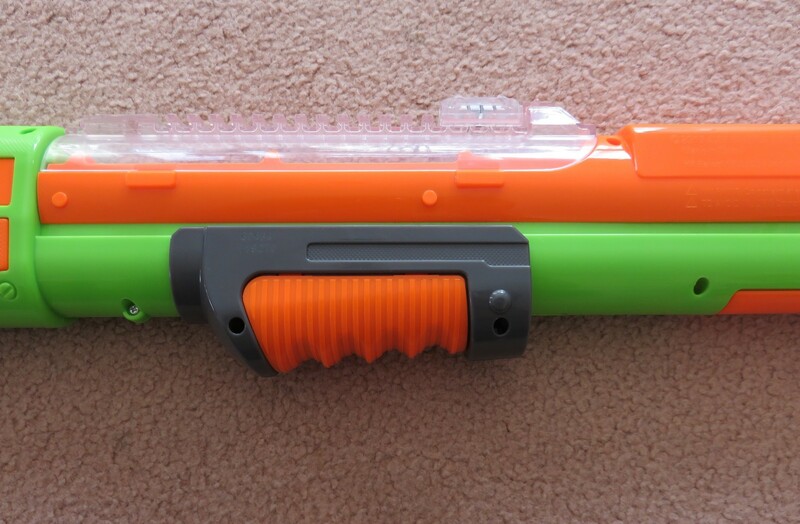 As mentioned previously, the Rail Raider uses an internal tube magazine. 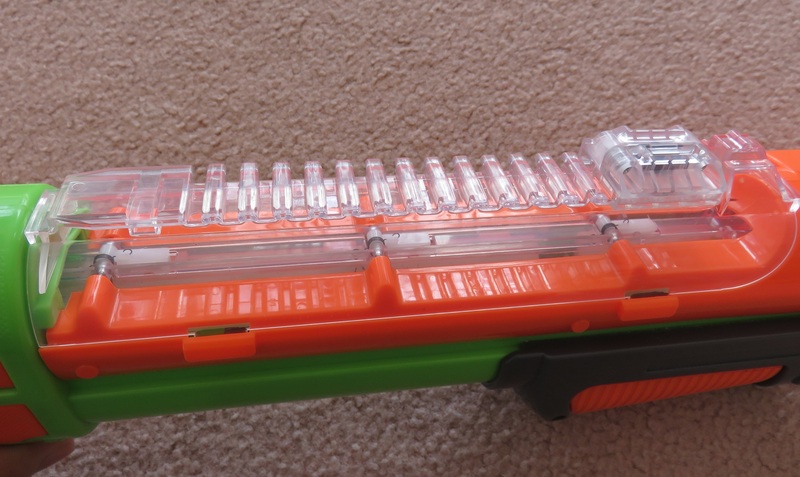 Part of the magazine can be seen through the clear section on top of the blaster. 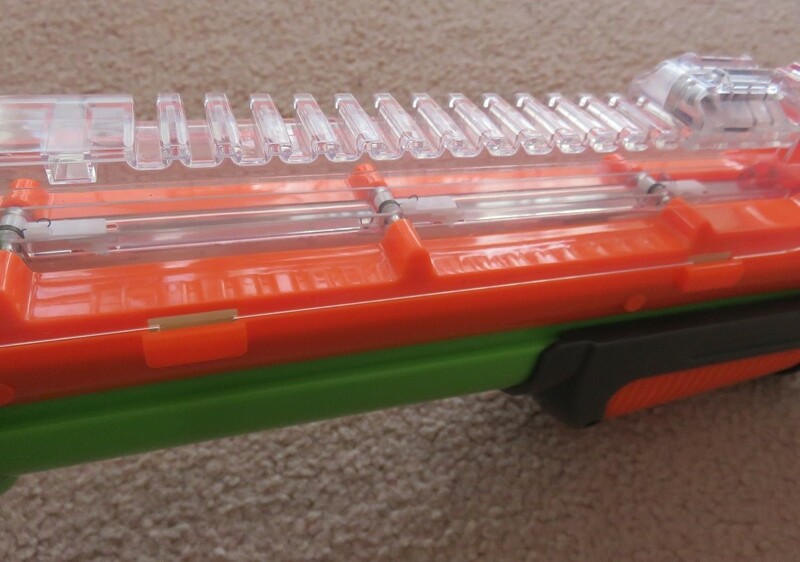 It uses a series of arms, small slopes and a large moving plate to pull darts forward to advance the magazine. 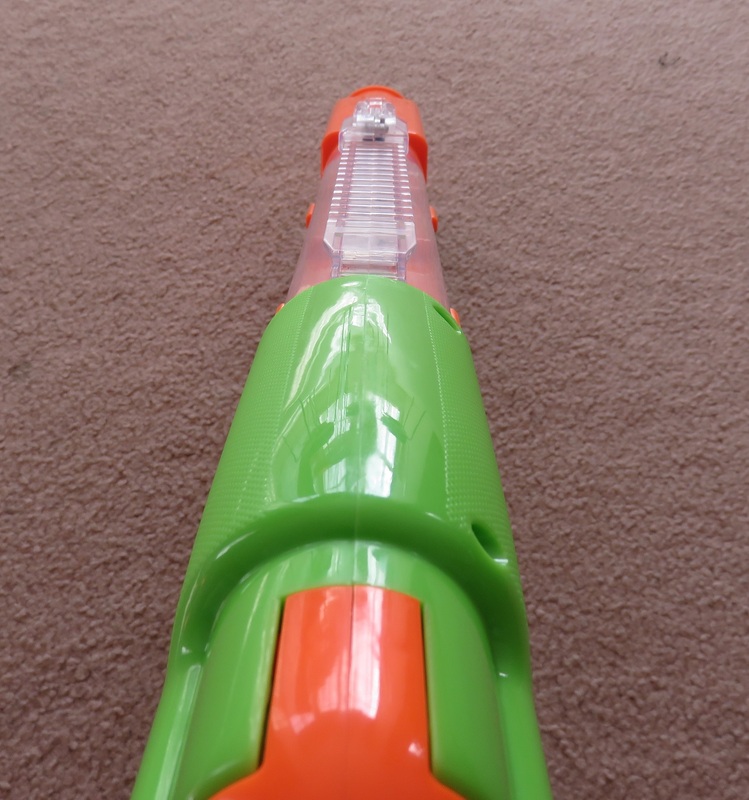 The magazine is closed at the rear by a dart door, which clicks into place. 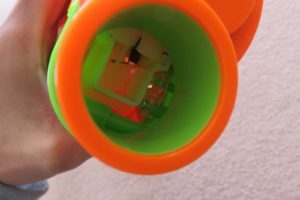 It can be unlocked by pulling it backwards, then lifting it up to expose the magazine. 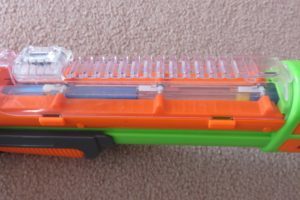 Once open, darts can be loaded into the magazine one-by-one. Loading in a new dart naturally pushes any already loaded darts forward. The magazine door must be closed before priming to allow the magazine to feed correctly. Space in the magazine caused by imperfect feeding. 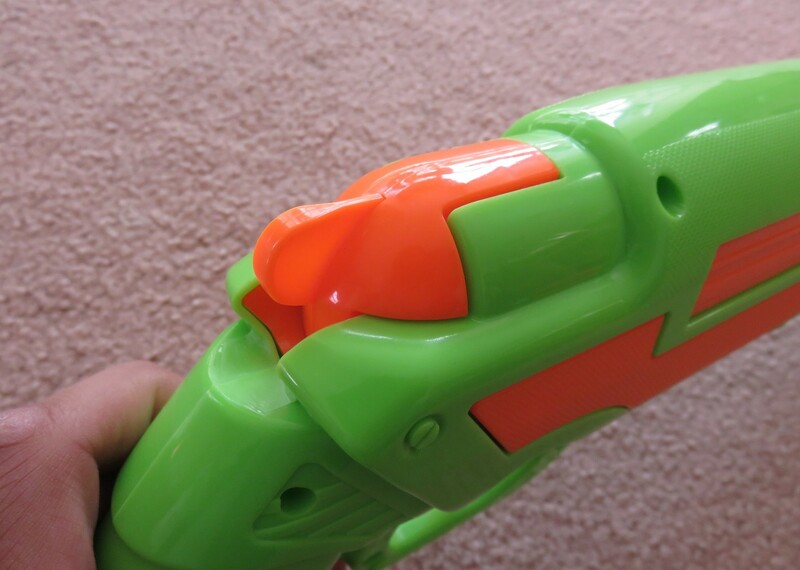 The blaster operates on the two strokes of the pump. 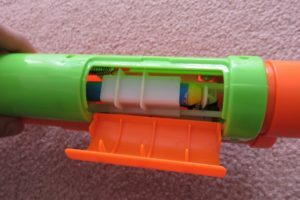 The backwards stroke primes the blaster’s plunger system, while also pushing a dart into the chambering area. The backwards stroke pushes the bolt forward, chambering the dart, and advances the internal magazine by pulling each dart forward. Magazine advancing can be a little unreliable on the rearmost dart, sometimes failing to pull it forward at all. This occurs most with deformed, thin or unusually short darts. 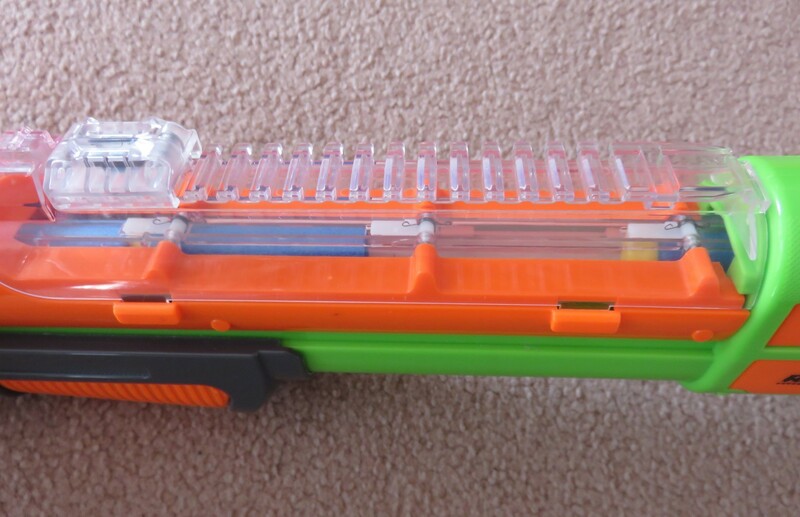 If this occurs, it leaves a space between darts in the magazine. 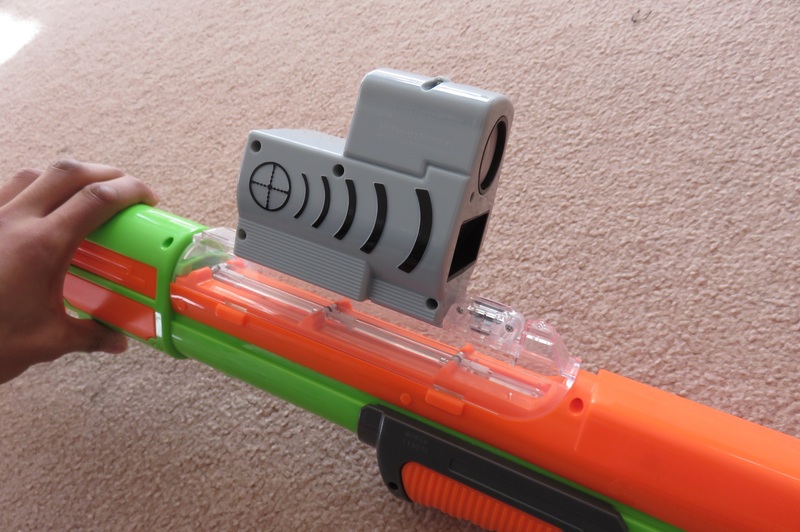 This would result in a blank shot. 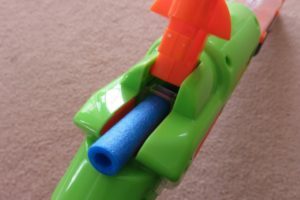 The magazine can be advanced without firing the blaster by holding the trigger down during the pumping action, however this runs the risk of loading a dart into the chambering area before it is ready. 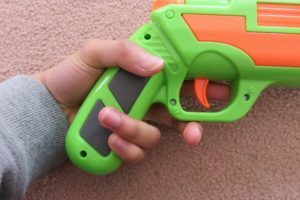 Such an action would result in an immediate and total jam of the blaster. 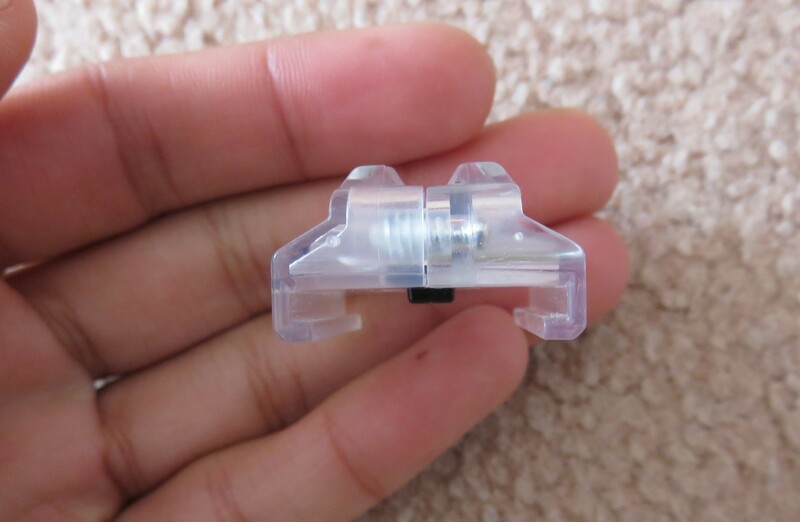 A look at the iron sight piece. 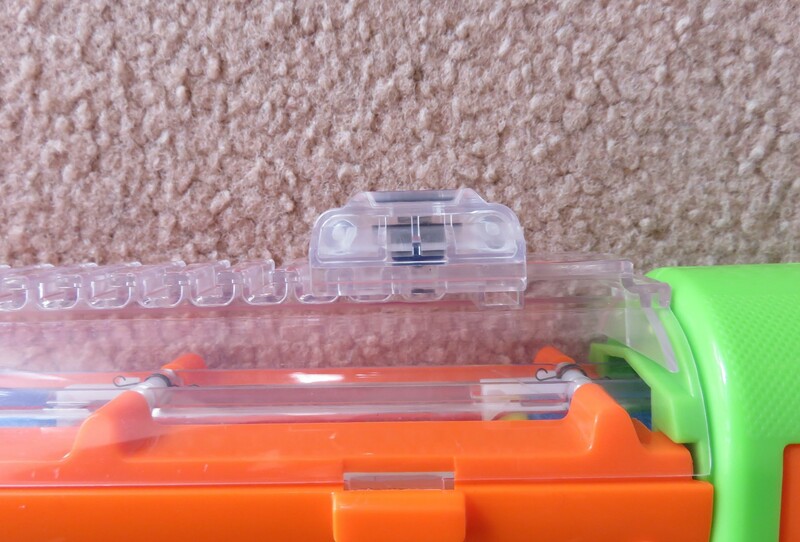 Sight mounted on the tac rail. The Rail Raider includes a small iron sight piece that mounts on its tactical rail. 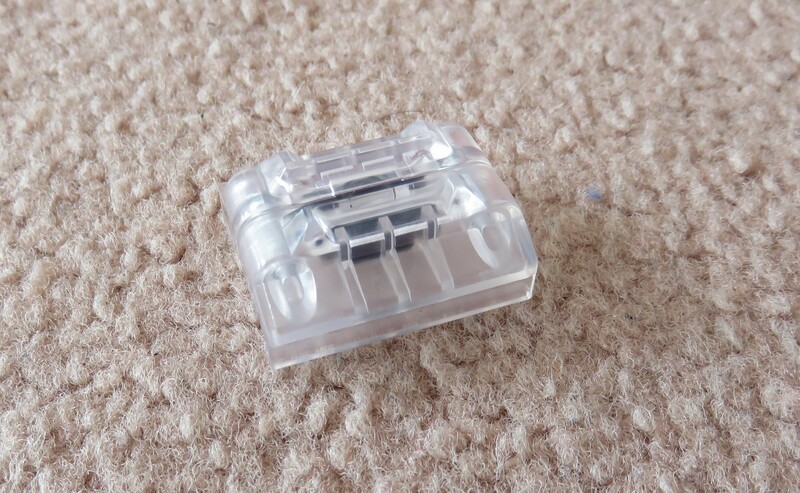 It is a very simple piece, nothing special to it. It mounts on Buzz Bee’s standard tac rail design, also found on the Thermal Hunter/Interceptor and Zenith/Stryker Force. 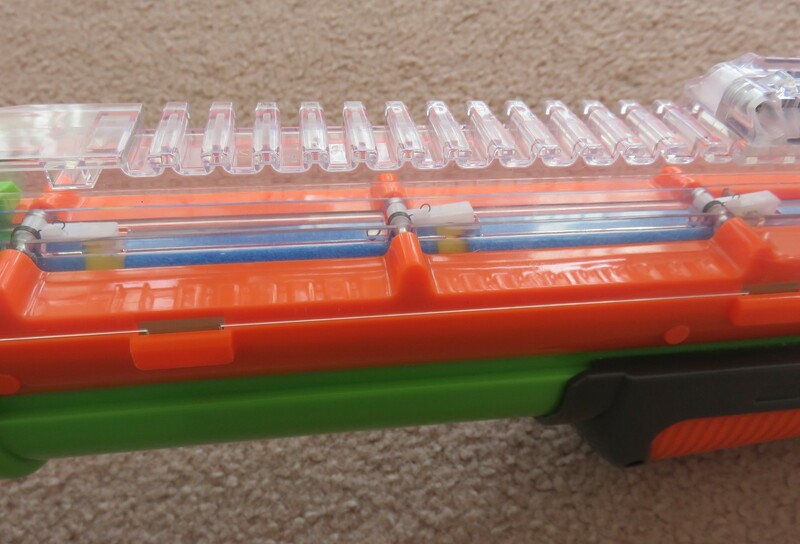 The Rail Raider averages around 70fps muzzle velocity with the darts I tried (Koosh, Precise Pro and Long Distance). 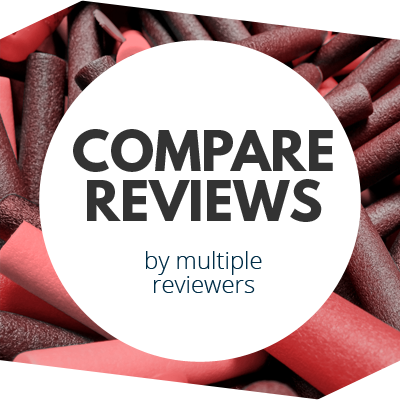 With the included Long Distance darts, this translates to around 10-15 metre ranges. These darts are very inconsistent and it is not uncommon for some shots to drop shorter than 10m, or soar further than 15m. Accuracy with Long Distance is also pretty terrible. 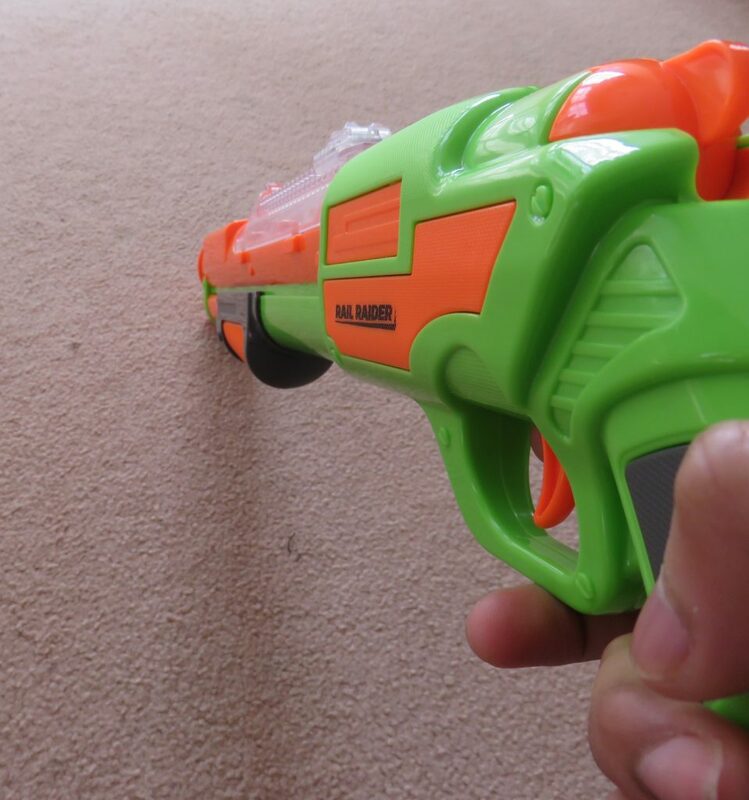 Very few shots actually fly in the direction the blaster is pointed. 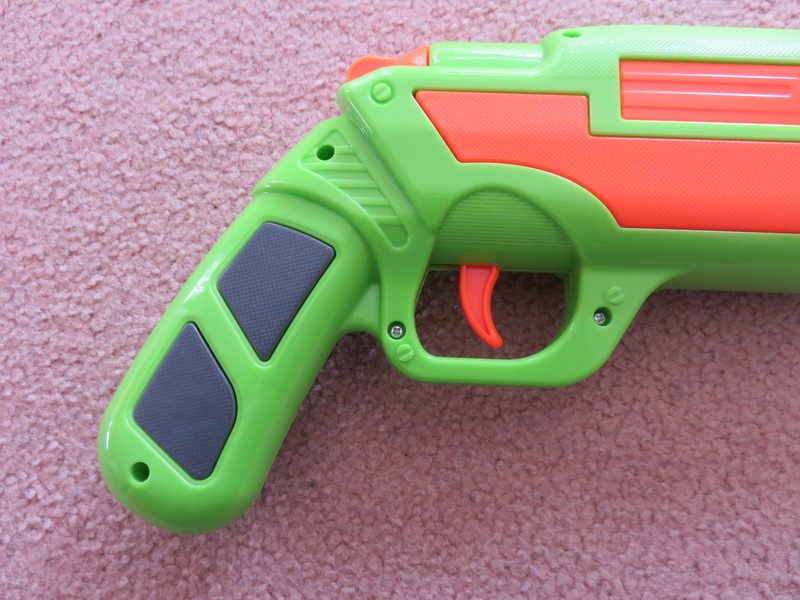 Rate of fire is limited to around 1-1.5 darts per second. The stock feeding mech is too unreliable to be used at 2 darts per second and faster, as jams become far, far more likely. The Rail Raider does not fill much of a practical niche. 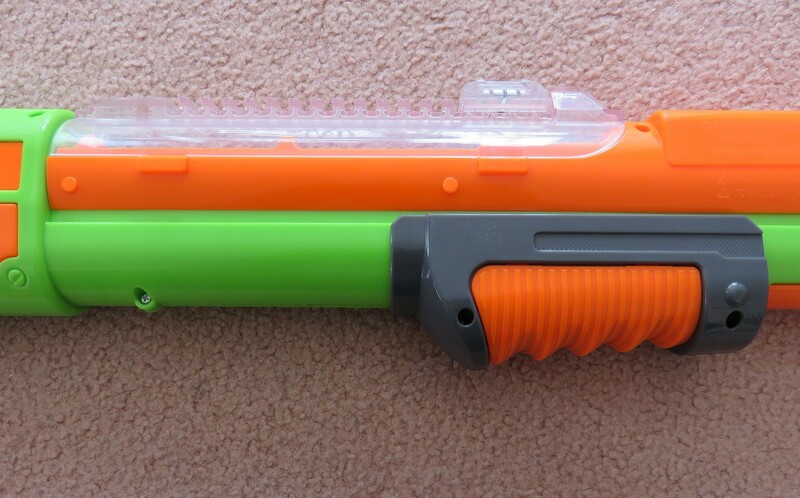 It has a very low capacity for a blaster its size, its ROF is relatively slow and it is relatively unreliable. 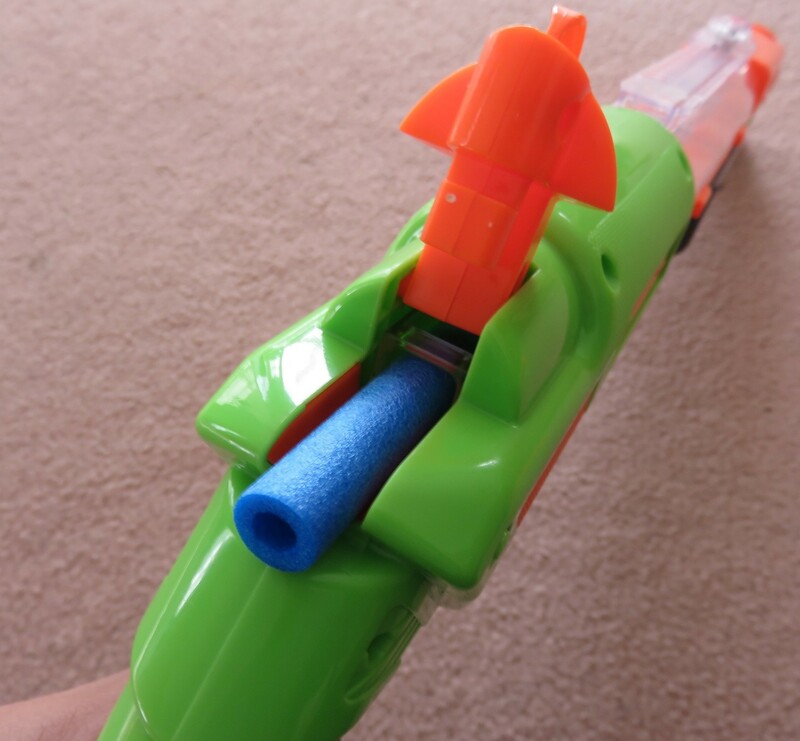 Possibly its only notable feature is its ease of reloading. 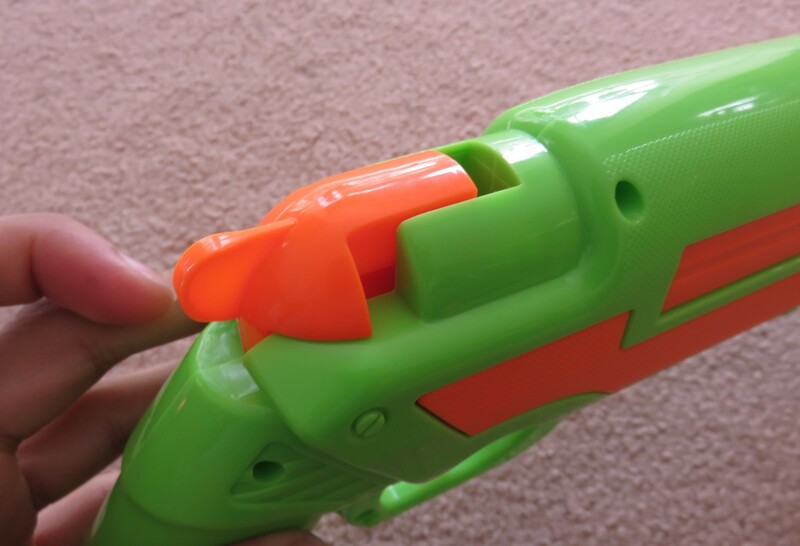 As it uses an internal magazine fed from the rear, it can be reloaded slightly more easily than a multi-barrel revolver or Smart-AR blaster. 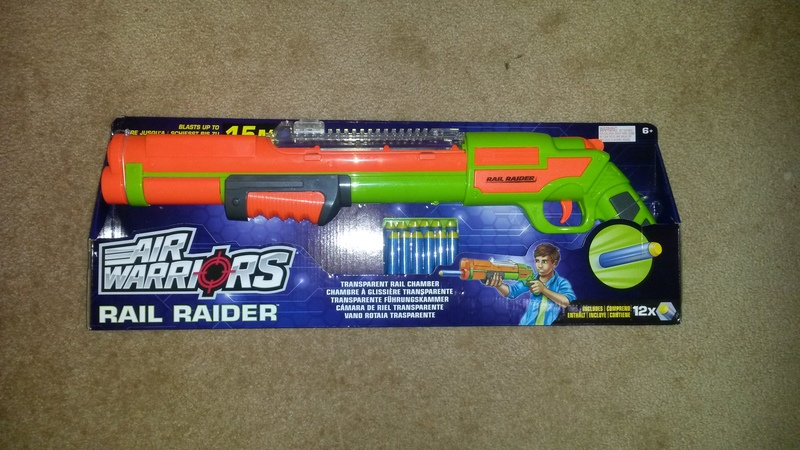 This lends to the Rail Raider having a notable niche as a scavenger type blaster. 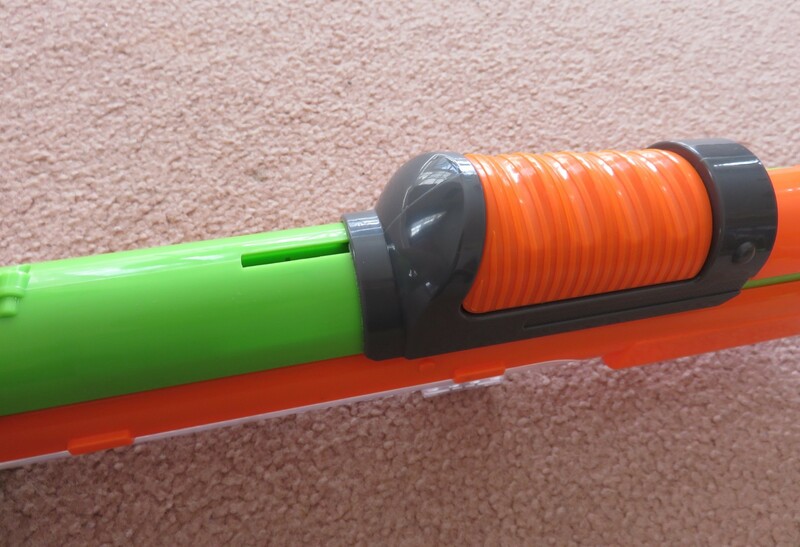 In general however, it is outclassed by many other blasters in just about any role. 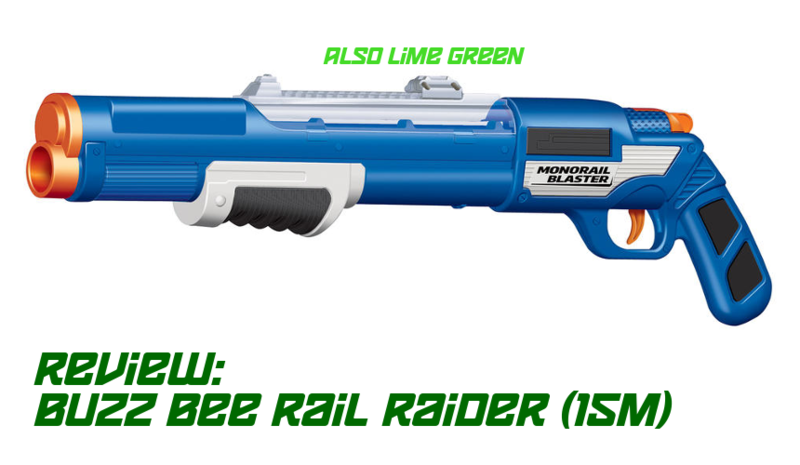 The Buzz Bee Monorail retails for around 20USD, while in Australia the Rail Raider is available from Mr Toys Toyworld for 30AUD. 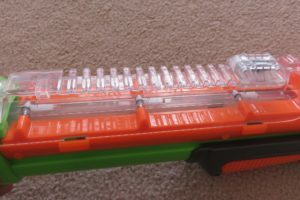 This puts it in the price range of such blasters as the Stryfe and Dart Zone Magnum Superdrum. 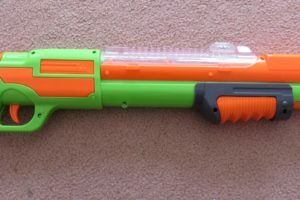 Compared to such blasters, it’s definitely not the greatest value out there, however it’s certainly no rip-off either. 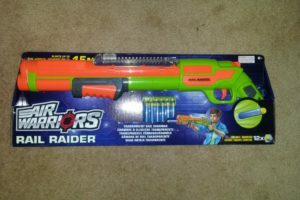 While not very practical for combat use, the Monorail/Rail Raider is a lot of fun and is very different to anything else on the market currently. 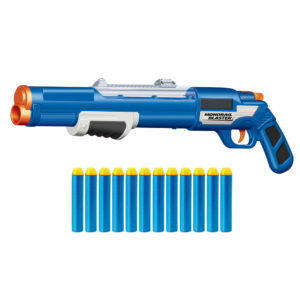 I’d definitely give it my recommendation if you’re looking for such a blaster. 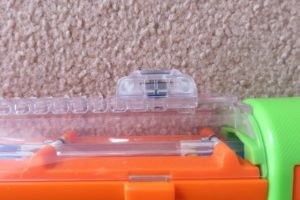 This entry was posted in Dart Blasters, Reviews and tagged 15m, australia, bee, blaster, buzz, monorail, raider, rail, review on December 15, 2017 by Outback Nerf. does it work with eliets? 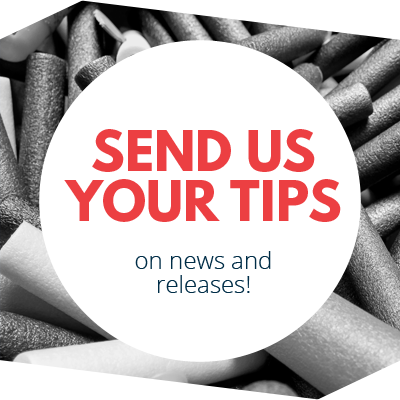 It is compatible with most full-length darts, which includes Elites. 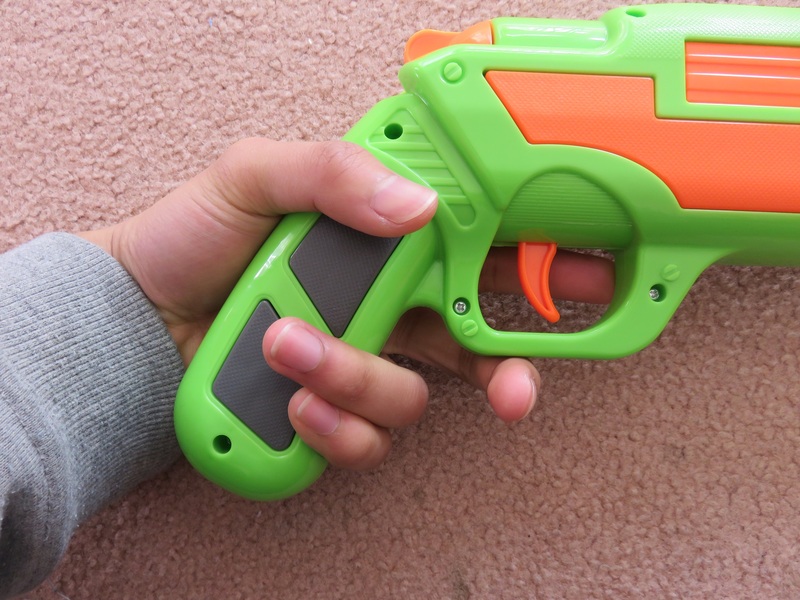 or could you make a speedloader for it? 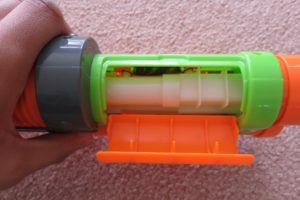 If you can make one that will fit within the tube magazine, a speedloader is possible. It would be quite long though.